Lilian Bobea is a Dominican sociologist, with a Ph.D from Utrecht University, Holland, and a Master's degree from the State University of New York (SUNY) at Binghamton. Her areas of specialization include security and defense issues, civil-military relations, and citizen security in Latin America and the Caribbean. Bobea has worked as a consultant for the Dominican government’s Democratic Security Plan and the National Consortium for the Study of Terrorism and Responses to Terrorism at the University of Maryland. She currently resides in Massachusetts. 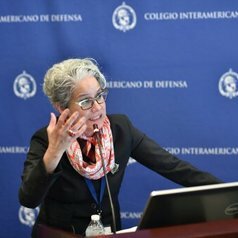 She is the academic director of Co-Paz, a training program for young reasearches on Citizen Security in El Salvador, Honduras and Domincan Republic and teaches at Bentley University and at the Latin American Faculty of Social Science (FLACSO), in the Dominican Republic. Bobea's articles on Caribbean defense and security, organized crime and citizen security include: "The Emergence of the Democratic Citizen Securit Policy in the Dominican Republic;" "Democratizing Violence: The Case of the Dominican Republic;" and “Private Vices without Public Benefit: the Dominican State versus Organized Crime.” She has been also the editor of several books, among them: Soldados y Ciudadanos en el Caribe (FLACSO, 2002); Entre el Crimen y el Castigo: Seguridad Ciudadana y Control Democrático en América Latina y el Caribe (Nueva Sociedad and FLACSO, 2003); La Gobernabilidad de la Seguridad en el Caribe: Inicativas de Reformas y Cooperación (Woodrow Wilson International Center for Scholars, Fundacion Guillermo Manuel Ungo, FUNGLODE and the Ford Foundation, 2010). She has also co-edited the books Seguridad Ciudadana en las Américas (Woodrow Wilson International Center for Scholars. www.wilsoncenter.org, 2007) as well as Cambios en la Sociedad Cubana Desde los 90s (Woodrow Wilson International Center for Scholars, 2005).